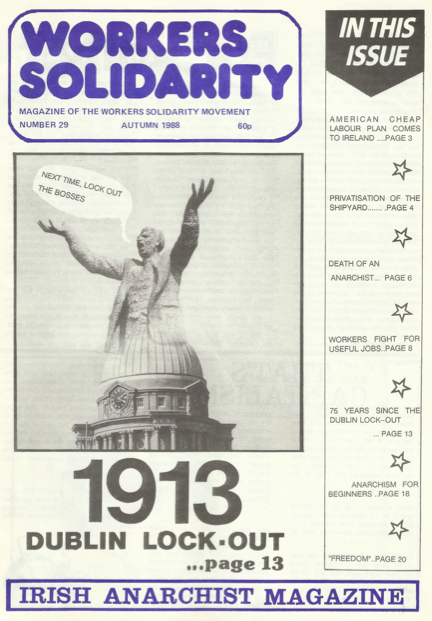 The annual magazine of the Workers Solidarity Movement, which was published from 1994 to 2009 when it was replaced by the Irish Anarchist Review. Circulation was 1,000 per issue. Some Marxists claim Marx was a libertarian, and Leninism and social democracy are not really Marxist. But in doing so they ignore the anarchist critique of Marx’s political ideas on the state, the party and the organisation of a socialist revolution. Conor Mc Loughlin looks at the contradictions within Marx’s political writings. The main organisational form in libertarian politics today is syndicalism. 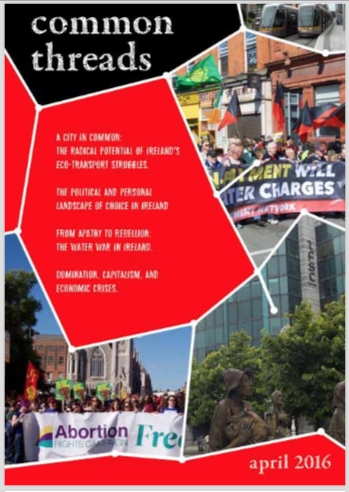 Alan MacSimon, a delegate to Dublin Council of Trade Unions who has also attended a European gathering of revolutionary unions looks at the potential, and limits, of syndicalism. Democracy has broken out in a range of countries in recent years – Guatemala, S. Korea and Argentina to name but a few. But, what is the reality? Kevin Doyle looks at a book that takes a more critical eye. On New Years Day of ’94 people awoke to the news that four towns in the south-eastern state of Chiapas had been taken over by a group calling itself the Zapatista National Liberation Army. 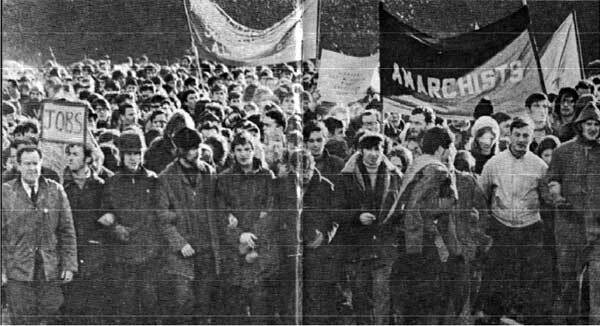 Dermot Sreenan, who recently presented a talk on the EZLN and organised a picket of the Mexican embassy in January ’94, looks at the politics and history of the EZLN. Mark Hoskins of the Workers Solidarity Movement and Ruth Coppinger of the Socialist Party debate the next steps after the defeat of the fight against the property tax on people’s homes. 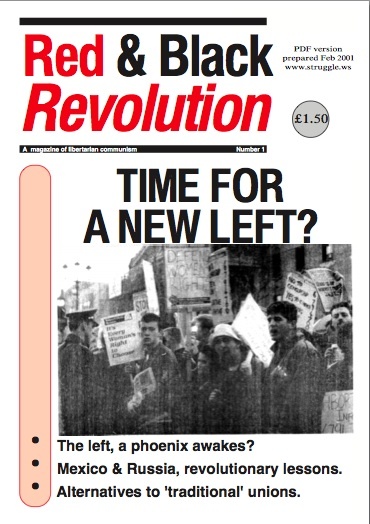 This appeared in the August-September 2013 issue of the Workers Party magazine Look Left. Look Left is available from many newsagents and bookshops, including Ireland’s biggest chain, Easons. Its circulation is about 5,000. – Kevin Doyle‘s A Fight for Useful Work, which looks at the response of Lucas Aerospace shop stewards in Britain to threatened job losses. Their proposal was to stop producing for the military and for people’s needs to be put before the owners’ profits. After assessing the skills and machinery in the firm’s plants, they came up with an alternative plan for socially useful production. Among their findings were that they could manufacture artificial limb control systems, a ‘hobcart’ to give mobility to children with Spina Bifida, heat pumps to save waste heat, solar energy cells, wind turbines, a combined petrol/battery car which could cut fuel requirements by up to half, and much more. “…it showed what enormous potential a society based on socialism could have”. – An obituary for Daniel Guerin; a veteran of the French resistance, anti-imperialist, gay rights campaigner and anarchist. Accompanying it is his article For a Libertarian Communism. – The story of the 1913 Dublin Lockout, retold by Alan MacSimóin, for its 75th anniversary. – A review of Cliff Harper’s Anarchy – a graphic guide. 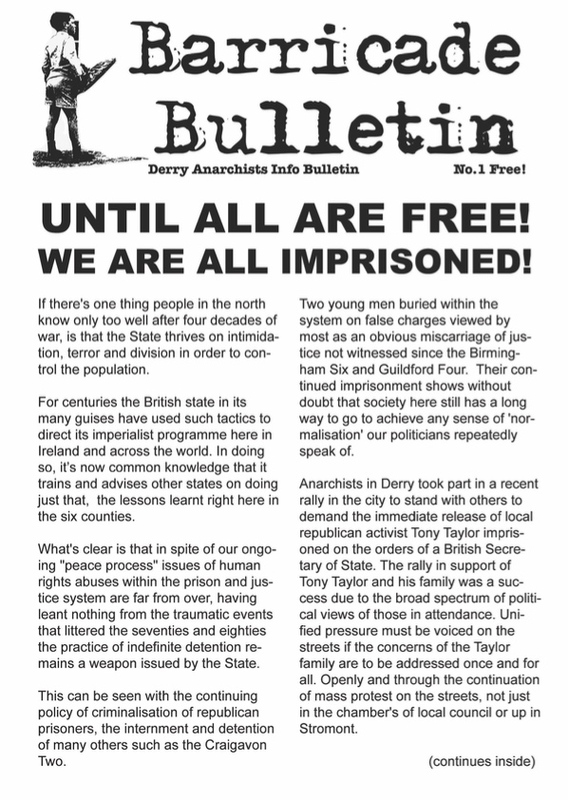 – The second ‘Thinking about Anarchism’ column, which ran for twenty years, was from Myles Kennedy. This one looks at ‘freedom’, and concludes that new and democratic forms of organisation are necessary because oppressive structures, like the State, “can only be used to impose the will of a minority on the majority”. – The leader of the Italian Communist Party sending a message of condolence upon the death of Giorgio Almirante, the leader of the fascist MSI party. This was the man who, 1944, ordered all Italians to rally to Mussolini’s Salo Republic within 24 hours and decreed that “those who do not present themselves will be considered outlaws and executed by shooting in the back”. Almirante died an unrepentant fascist. 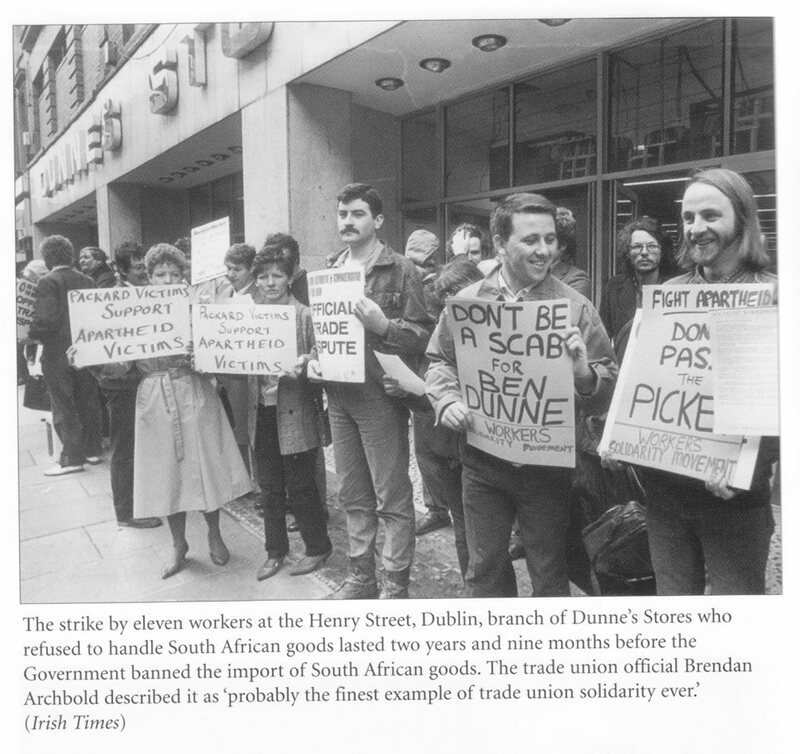 – How a union won Ireland’s first workplace agreement prohibiting discrimination against workers with HIV or AIDS, and did this at a time when there was irrational hysteria about this condition. 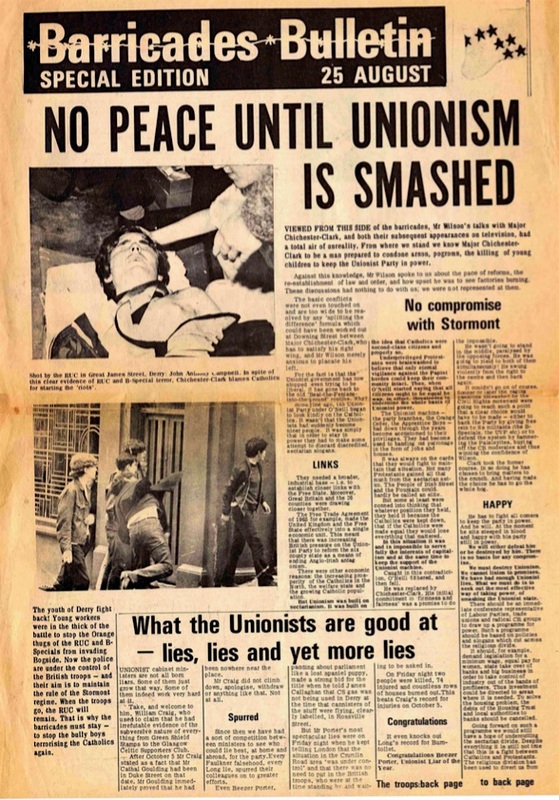 – The privatisation of the Harland & Wolfe shipyard and Shorts aircraft factory, or how those mainly loyalist workforces got a slap in the face inreturn for their loyalty. – The arrival of ‘two-tier’ wages in the Bank of Ireland.